Hi again! I’m Lemon. The staff at the Humane Society was SURE I would be adopted by now because I am just a gorgeous cat and super-sweet to boot, but here I stay! I’m just waiting for the perfect family to come in and take me home. 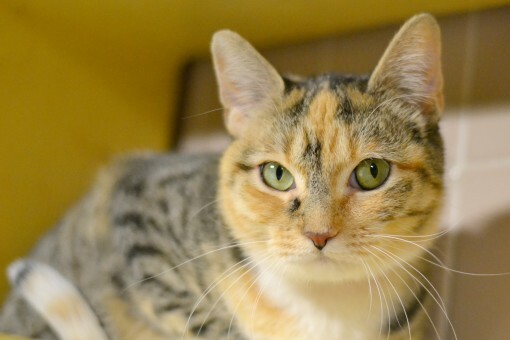 I am a brindle tiger tortie mix who is looking for a nice windowsill to curl up on. A warm lap would be nice too! I am a little shy at first, but I love attention, and I would love to be your new best friend. I almost scored as a sidekick, which means I’m independent enough to be left alone but I love company, especially if you come bearing goodies! My adoption fee is $68 and includes a voucher for a veterinarian exam, vaccinations, 45 days of pet health insurance, and a microchip. Stop by Humane Society of the Pikes Peak Region at 610 Abbott Lane in Colorado Springs to see me and all of my friends! Click HERE for directions.